I made a rhubarb crisp this week for my coworker's birthday. The rhubarb I used was from my bountiful harvest last July. It was still great even though it had been frozen for more than eight months and has made me even more excited for my garden! I modified this basic cinnamon apple crisp recipe from The Merry Gourmet's Merry-Jennifer Markham that was posted on Mom It Forward. 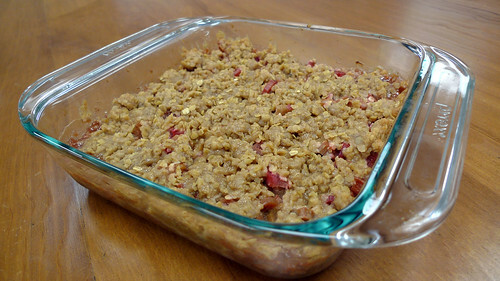 Here were my changes: Obviously I used rhubarb instead of apples, but I also omitted the lemon zest and juice then added a bit more brown sugar to the filling and some oats to the topping. I also used pumpkin pie spice instead of nutmeg because that is what I had on hand.